The North East’s leading livestock feed company, Northumbrian Quality Feeds (NQF), have today announced the appointment of an Agri-Livestock Specialist to work with livestock farmers across Northumberland and the Scottish Borders. 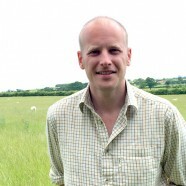 Will Hopkins, who previously held the same position for Mole Valley Farmers at their Alnwick store, has plenty of experience having been responsible for over 1000 accounts for the store. Will made the move from the farm store giant to the family run firm NQF in order to have a more ‘hands on’ relationship with farmers. NQF provide a comprehensive range of conventional and organic feeds for customers across Northumberland and the Borders. Livestock farmers Stuart and Wendy Hyslop founded the business in 2007. The business provides both conventional and organic ranges of Nuts, Rolls, Pellets, Mixtures, Blends and Minerals, for either delivery or collection from its North Northumberland Coast base at Easington Farm, Belford. Will also brings to the team his newly qualified status of R-SQP. This qualification is gained from the Animal Medicines Training Regulatory Authority (AMTRA) and means he is qualified to give advice on feed, prescribe medicines and devise animal health plans for farm animals, equine and companion animals. As a company run by “farmers for farmers” across Northumberland and the Scottish Borders, the entire team of seven employee’s aims to ensure that each farmer’s animals’ nutritional requirements can be met at all times. The importance of the correct feed packages for livestock is of great importance, and this is even more critical when margins are so tight for farmers. This is why NQF’s tailor-made solutions for individual farms are so essential.